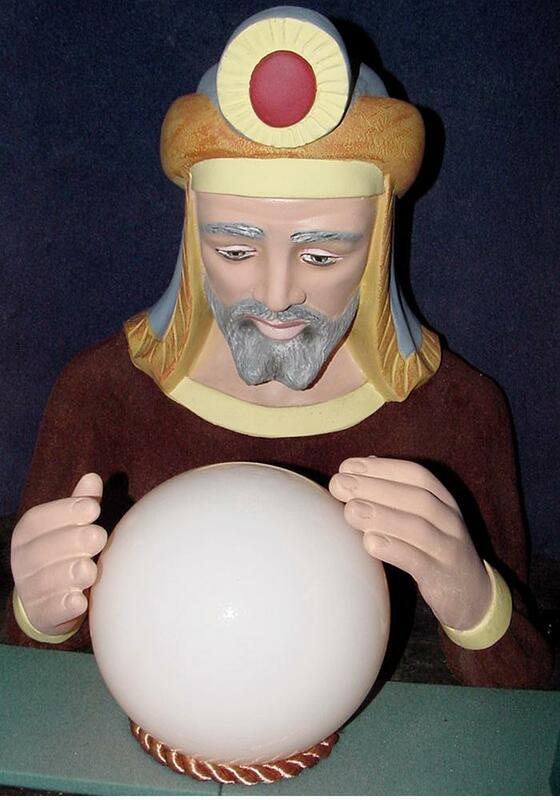 Description: Zoltan fortune teller, Prophetron, 8/69 (but made from 1967 to the early 1970s), he does not move, but ball does light up and glow as fortune is read using a patron-held phone, endless loop tape cartridge by Bernard Cousino, fiberglass style body on an integrated pedestal stand. Deposit a dime and push one of twelve buttons on the front of the machine that correspond to the twelve signs of the zodiac, which are on a glass just above each button. All the buttons are wired in parallel, so pressing any button just starts the tape system, which has 14 different fortunes, all about one minute in length. The fortune plays and when done, a conductive tape on the tape loops closes a switch, which turns off the tape player. Zoltan's crystal ball is lit by an eerie light. 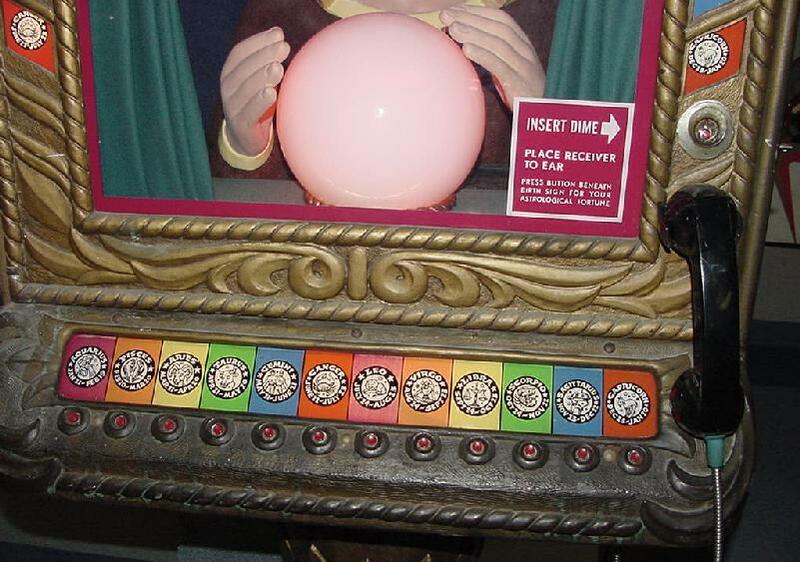 When one of the zodiac buttons is pushed, the crystal ball lights up brightly and illuminates Zoltans intriguing face. Then after a short pause, a somewhat mystical background music fades in and Zoltan begins speaking your fortune in a low voice with a heavy Hungarian accent. 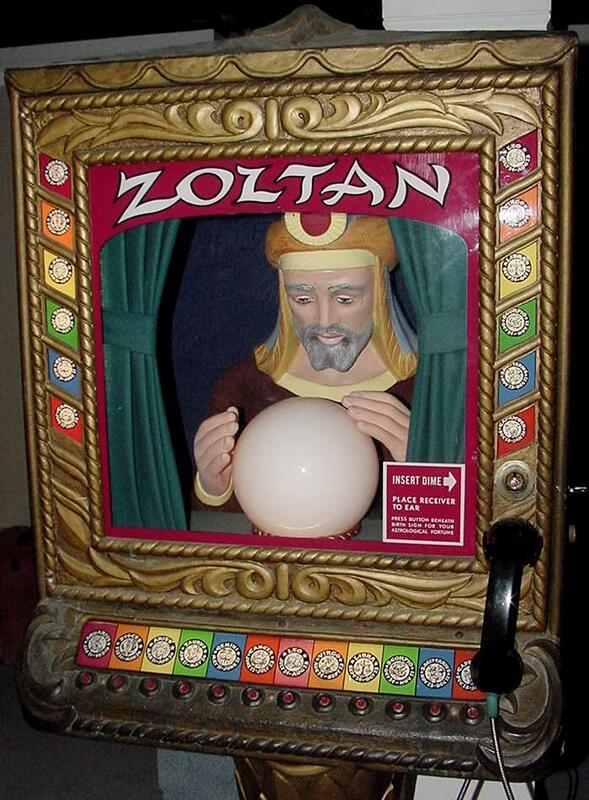 Zoltan usually starts out with "this is Zoltan speaking" or "greetings from Zoltan" and the predictions, which last about one minute and includes things about your future, lucky numbers, and favorable colors. Zoltan was a project done by Robert B. Bourque and Robert Cottle. A lifelong friend of Robert Bourques was Mr. Cottle, who provided the deep voice heard on the machine. Note Robert Bourque at one time played "Captain Bob" on a Boston children's TV show. 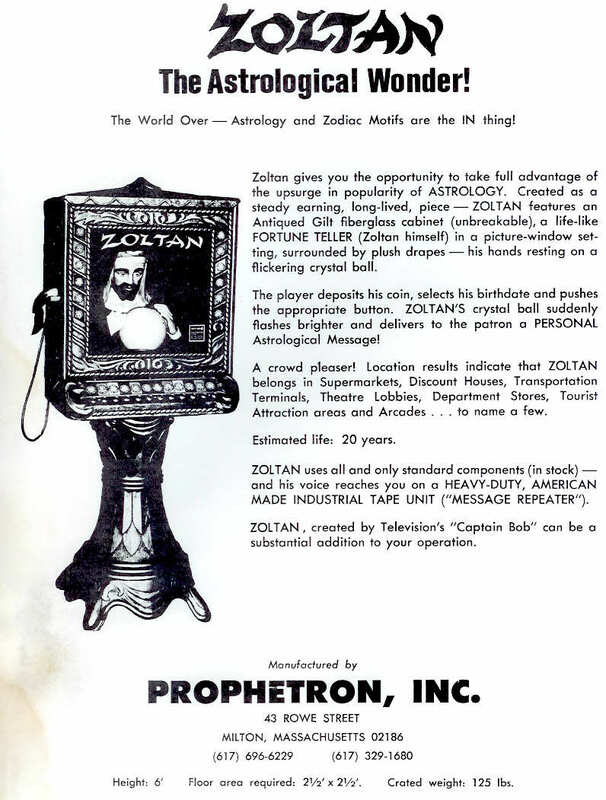 Supposedly Zoltan was made from 1967 to the early 1970's in Massachusettes. Robert Bourque passed away at age 82 on March 22, 2003. If you want to hear one of the Zoltan fortunes, click here for a MP3 version. Note there are other Zoltan Cousino tapes other than the "stock" tape. I have heard of Zoltan in other languages and a Christmas version of Zoltan Cousino tapes. I am using a solidstate device to play my fortunes which can be seen here. I highly recommend this device has it does away with the original and obsolete Cousino tape player. The box works flawlessly, is plug-and-play, and it absolutely sounds great (but it also sounds original too). In the 1988 Tom Hanks' movie "Big", a fortune teller machine with the name "Zoltar Speaks" was used ("Zoltar Speaks" turned the 13 year old character into the grown-up "big" Tom Hanks). 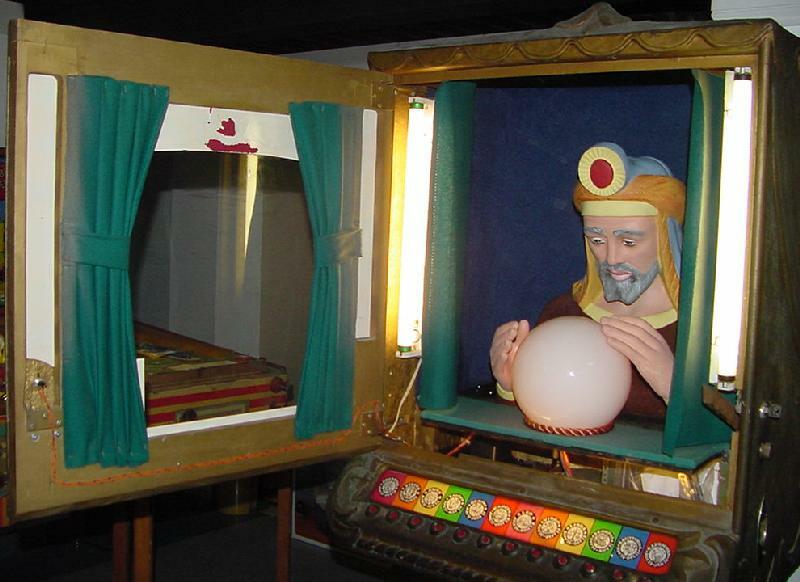 Though the name is similar to "Zoltan", the two fortune tellers are nothing alike (in looks or operation). 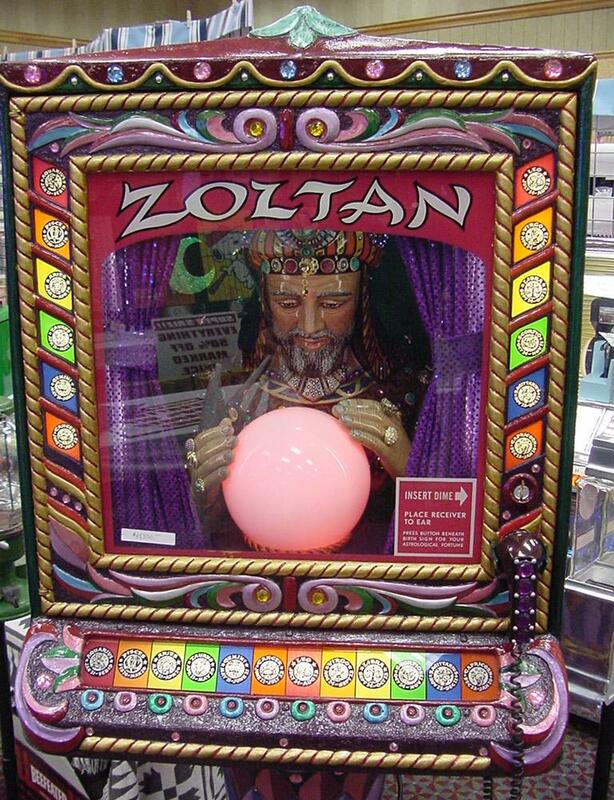 This is often confused, with people claiming Zoltan is the fortune teller used in the movie "Big". This is simply not true. 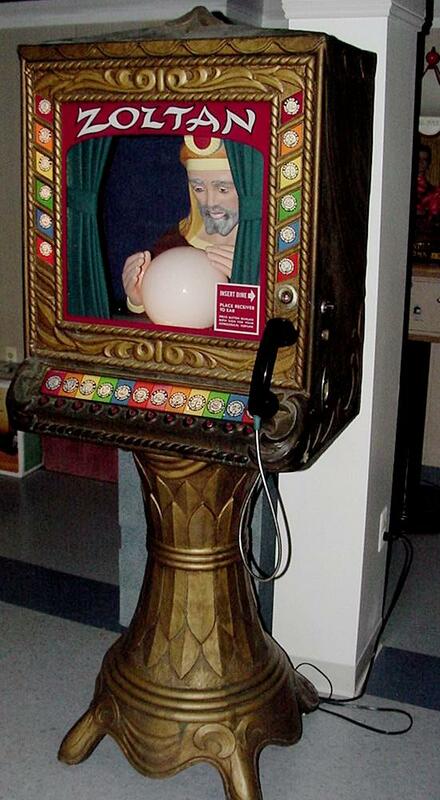 In the Hanks movie, the "Zoltar Speaks" fortune teller had a coin roll skill operation (coin had to be rolled into the teller's moving mouth), the teller was animated, and the teller dispensed a fortune card. Zoltan of course does not do this (nor does Zoltan look anything like the movie's "Zoltar Speaks", which had a full size oak style cabinet, much like 1930s Fortune Tellers). Ths author's Zoltan with an original Zoltan multi-color front glass. sides of "Zoltan" and the "dime" price. This is a remake of Zoltan glass, probably in the 1970s. Notice the barber pole-like designs instead of the astrological signs. This was done so the glass could be re-screened with only two colors instead of the 10+ colors used in the original design. from 10 cents to 25 cents per play. The phone receiver is original on this machine. 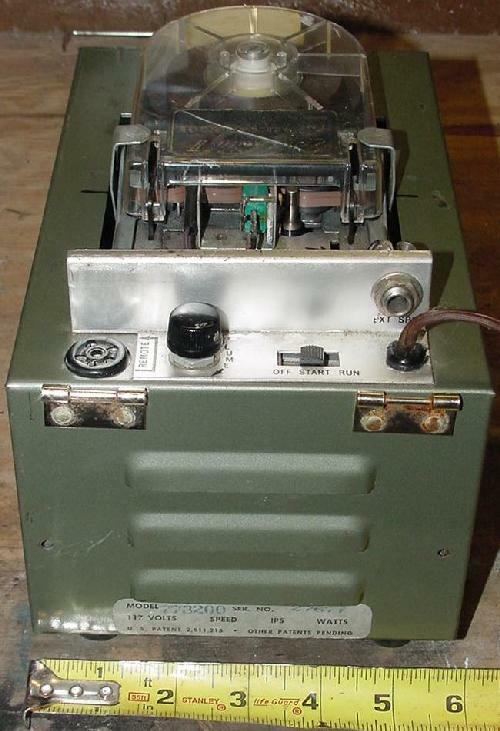 The Cousino endless tape player used in Zoltan has an interesting history. When Bernard Cousino put a 1/4" tape in an endless cartridge, he found that more than 45 seconds worth of tape loop would bind the tape. The problem was not only friction but static electricity. Cousino invented and patented a "double coated" tape. This tape was treated on the back with colloidal graphite, which lubricated the tape in the pack and also conducted away static. 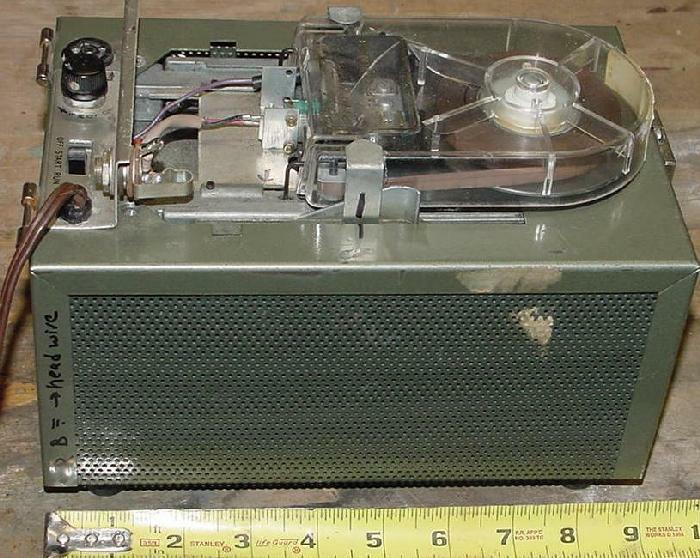 Cousino soon developed a cartridge specially adapted for endless audio tape that he marketed in 1952 known as the Audio Vendor, through his company Cousino Electronics. 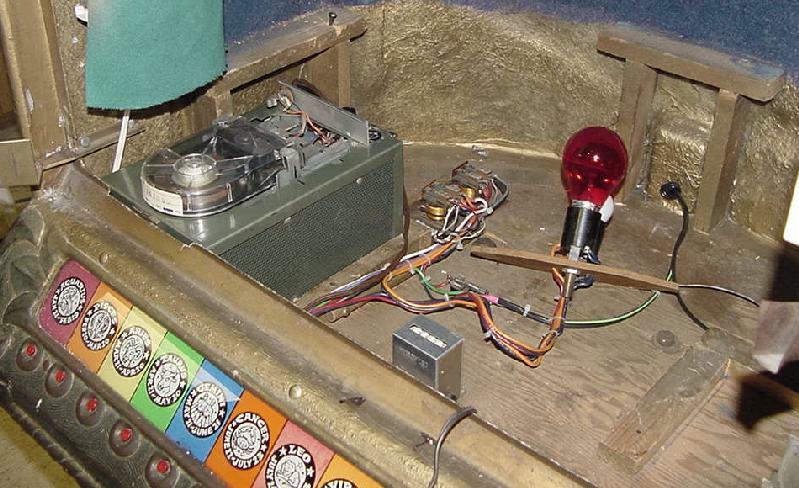 A fully enclosed version was later called the "Echomatic". Here's some pictures of the 1969 Cousino endless tape player that was used in Zoltan, model number 773200.
to the 'hood and got a make-over! Man that's ugly.